New Baby Self Care. My baby is here, what do I do now? New baby Self Care. Not impossible and not trying to find time for a facial. Once you have your new baby there’s a sudden shift of interest from friends, family and often even health professionals. From everyone being concerned with your health and wellbeing as a pregnant mum suddenly all the interest is in how your new baby is doing. Most of your interest is there too. Now you are a mum, the centre of your world has shifted. Your most urgent need is always to make sure your baby is happy and healthy. But this doesn’t mean you don’t matter anymore. Looking after yourself and having someone to look after you is still important too. This might be the point you really need a doula in your corner because this is likely to be one of the most intense six weeks of your life and someone who knows how to support you to find your way through could be vital. Your postnatal doula is there for you however you need her to be there. She’s there to remember to look after you when you forget to look after yourself, to help you have a shower or a nap when you need one, to remind you to eat, to make sure the basic housework is done so you relax and don’t try to do it yourself. Most of all she’s there to listen to you, to understand your worries and joys and to support you with caring for your new baby and learning to be a mother. I asked the Hampshire Doulas what their top tips are for making it through those first six weeks we came up with lots of ideas which all fit into a few main themes. First look after yourself, be gentle with yourself. This time is precious, you don’t need to get back to normal, you don’t need to fulfil some kind of superwoman ideal that involves living the same life as before your new baby arrived as if nothing has changed. Everything has changed, sleep will be different, learning to feed and care for a baby can be hard work. Looking after yourself may seem like the last thing you have time for but you can’t pour from an empty cup, now is the time to make time for self-care. For you, that might mean staying in your pyjamas for a week or it might mean getting up and having a shower and getting out the house even if it’s just to go for a walk around the block, this is about you, do it your way. Trusting our instincts (or gut feelings) is not something we’re always used to doing in our everyday lives but they don’t go away just because we don’t notice them all the time. When we have a new baby the raw and sometimes overwhelming experience is the perfect time to reconnect with what comes to us as instinct. You won’t have to think about whether or not to respond to your baby when they cry your whole body and mind will do it and as you care for your baby you will learn gradually to understand your baby’s communication. You will learn which cry is for hungry, which is for wind which for dirty nappy and when your baby is telling you they are tired. Be gentle with yourself it takes time, but listen to yourself. If you know you are too tired take action and get some help to get some sleep. 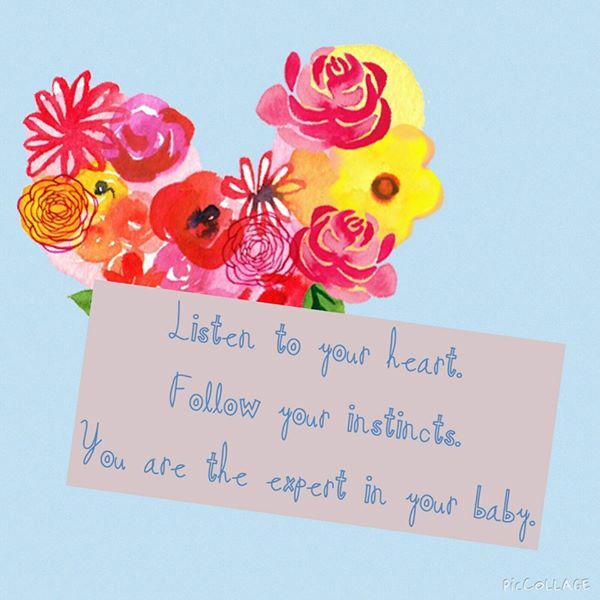 If you know something is not quite right but you can’t put a finger on it then call your midwife or health visitor don’t over think and worry you’re just wasting their time, your instincts are there for a reason. If you feel like you can’t connect with your baby or you can’t cope with all your feelings or you can’t feel happy or you can’t stop the worry and panic, trust your instincts, it’s not supposed to be like this, talk to someone. Talk to your partner, your midwife, your doctor, the PANDAS helpline, just don’t bottle it up, get help. Finally, always accept and ask for help and support from those around you. Don’t fall for the myth that women should do this alone. We need our friends, family, baby group, online support group whichever works best for you. One thing you could do is get the people who want to visit to pay for cooing over your baby by pushing the hoover round or doing the dishes or bringing some dinner with them. But always feel free to say no, I’m not up for visitors today, or just invite the people who will sit by your side on the sofa and not notice the mess, do what works for you. Lots of mums find it’s helpful to be super honest with their close friends, admit it’s hard and talk about the ups and downs. Often, we find being honest gives others the freedom to be honest too, we all find it hard sometimes and we need each other to encourage us to keep going and enjoy the good times. As doulas we never give advice, all of these are just ideas, information from people who have been there and got the t-shirt (it’s covered in baby sick) which we hope you will find helpful. If you already have plenty of people in your life who have an opinion on the best way to care for your baby then a postnatal doula can be a great person to have on your side. We always trust that you will make the right decisions for you and your baby and we are there to support you to do things your way. We think new mums and dads are awesome and we want them to feel that way about themselves. Our ultimate goal as postnatal doulas is to do ourselves out of a job, to support you in a way that leaves you with the feeling, I can do this.